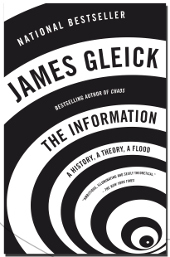 James Gleick has never been shy of approaching big topics. I first came across him many years back reading his just-published Chaos which remains for my money the single best introduction to the mind-bending world of chaos theory on the market. Since then he’s tackled biographies of intellectual behemoths Isaac Newton and Richard Feynman as well as a thoughtful treatise on the apparently accelerating pace of modern life. However, he’s saved the best for this release. The Information: A History, A Theory, A Flood takes on the very concept of information itself, tracing its transmission and dissemination from African drumming through to modern-day quantum computing. A daunting task to say the least. Thankfully he’s more than up to the task. The first half of The Information is essentially a fast-track history of our attempts at communication beginning as mentioned with African drumming. For many westerners our only exposure to this art has been a patronising, distorted or outright racist depiction of bongo-pounding savages in the darkest jungle. Gleick swiftly puts the lie to this outdated notion with a gushing account of the incredible complexity achieved by so simple an idea. However, key to this section as well as those following on from it is his razor-sharp analysis of the limitations inherent in them. The recurring notion of redundancy rears its head here for the first time and you’d better pay attention because it’s one of the stars of the show. From here we travel spatially and temporally, stopping in at the Middle East and Ancient Greece to check out the invention of the written word. Given the gusto with which I rail against anti-piracy copyright barons in the internet age it was with no small chuckle that I discovered Plato himself was none too keen on this new-fangled ‘writing’. It wasn’t for the same reasons as the grisly media cartels – he maintained it would forever destroy our memories – but it’s interesting to note that technophobia has been present at every advancement in the informational arena. There are a few more pitstops along the way but I’ll not delve too deep here save to mention there early dictionary pioneer about whom we know nothing save that in 1611 he visited London where he may or may not have seen a dead crocodile. For an information pioneer this is a cruel irony indeed. So much for the history, for me the exposition on the current state of information theory was the icing on the cake and it’s all down to one Claude Shannon, a little-known mathematician who by all rights ought to be a household name. I’ll leave the details to Mr Gleick but without Shannon we would have little in the way of telephony, internet, satellite communication, almost everything we currently take for granted. At this point in the books the heavier scientific concepts come into play but the author is a master at boiling down fuse-blowing theories and equations into easily handled chunks. At no point does the technical load become heavy enough to put the casual reader off and if anything they’ll come away greatly enlightened. Reference junkies will be happy too as almost a third of the book is taken up by comprehensive notes and a bibliography which had me salivating. It’s hard to give an idea of the scope of The Information in a short review but take it from me that it’s one of those books which peels your eyelids back and lets you see farther and wider than you could have imagined before. James Gleick manages to achieve a near perfect balance between humourous historical anecdotes and masterful scientific presentation. The previous titles I read of his were true classics in the popular science genre and this is possibly his greatest to date. Simply essential for any citizen of the information age. Buy The Information via the Vintage website.